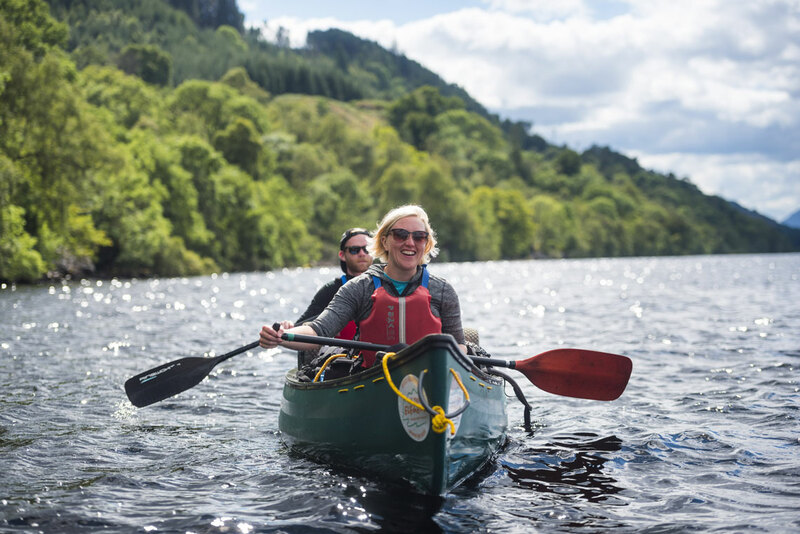 Starting from picturesque Fort Augustus, you will get the chance to explore the southern end of Loch Ness in very stable open (Canadian-style) canoes. Enjoy stunning views and experience the likes of Inchnacardoch Bay, Cherry Island (the site of an ancient ‘crannog’ - house on stilts), Fort Augustus Abbey and the mouths of the Rivers Tarf and Oich from the unique perspective of a small boat on the big loch. If the weather is calm we will also head out into the middle of the loch to look for Nessie…. History buffs can discover how Fort Augustus got its name and learn about the engineering marvel that is the Caledonian Canal. Suitable for adults and children aged 7+. Young children will sit on an extra third seat in the canoe, so there are still two people to paddle and control the canoe. There are buses available from Inverness and Fort William or you can drive there too along the A82 road. It's a lovely little town and really worth a visit in its own right. Fort Augustus provides an awesome view up Loch Ness from its position at the southern end of this most iconic of Scottish lochs.